About a week ago, I went to Wandsworth’s Southside shopping centre and found out that Poundland was closed due to rodent infestation (see: Rodent infestation shuts down Poundland). 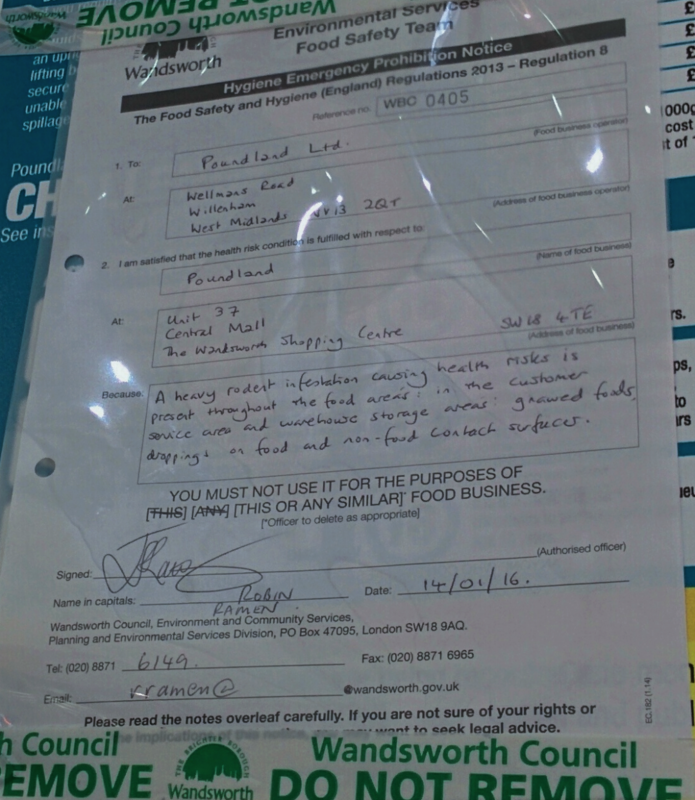 The hygiene emergency prohibition notice issued by the council and closing the shop was dated 14 January 2016. Today I visited the shopping centre again, and Poundland was still closed. The infestation must be serious and the clean-up operation laborious: or is it quite normal to take this long to get rid of rodents? On 18 January, the magistrates’ court issued a hygiene emergency prohibition order. A heavy rodent infestation causing health risks is present throughout the food areas in the customer service areas and warehouse storage areas: gnawed foods droppings on food and non food contact surfaces. All this has to be very bad for Poundland. There is the issue of reputation and trust: no business would want to be associated with a heavy rodent infestation, especially those that sell food. There are a number of chains of pound shops, so Poundland may end up losing customers to its rivals. As far as this branch is concerned, losing so many days of sales and destroying the affected stock must be costing a lot. I am no retail expert, but I imagine that Poundland and other pound shops need to sell a lot of products to be profitable. It’s about constant footfall and volume, since margins are small both in absolute and relative terms. Poundland is a big chain, so it should be able to absorb the costs arising from this particular store, but losing money this way goes against the whole business model and ethos, and one wonders what kind of structure and training was in place to keep the store clean. When will this Poundland shop start to trade again? Perhaps I should pop in again soon.